Simple silver plated small chalice is a favorite for cordials as well as ceremonial and ritual use with a graceful, hand turned stem. 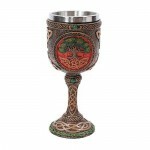 This silver plated over brass chalice is 4 inches high with a 2 inch diameter cup and a nicely turned stem. Holds about 6 ounces. Made in India. Plain bowl could be engraved as you desire (not available from us). Item Number: OI-CLC10 | Approximate Size (Inches): 2.00 wide x 2.00 deep x 4.00 high | Approximate Shipping Weight: 0.50 lbs.